Then there are the jersey cards that make you scratch you head when the swatch of jersey does not match the picture on the card. Like, not even close. Some people who read this blog may get annoyed with these “Franken-Cards,” wondering why they’d bother using a different jersey, or why they could just change the picture to that’s team’s uniform. It can’t be hard, like double checking to make sure the city skyline image is correct before superimposing a player over it. 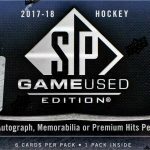 But sometimes, if you look a little deeper, you’ll find some of these cards can be pretty unique and tell a story about a player and his past. Bobby Lou has been good enough to only have played for three teams in his 15-year NHL career. Either that, or he had an untradable contract. Whatever. Hindsight being 20/20, in 2010 he was the unquestioned number one goalie of the Vancouver Canucks (shut your pie hole, Cory Schneider), and his time with the Florida Panthers was fading memory in the rear view mirror, not yet a realized dream on the horizon. 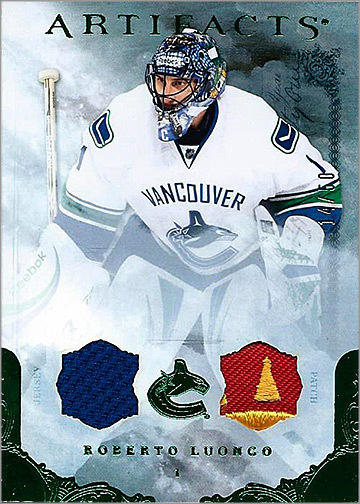 Upper Deck didn’t punch out two Canucks uniforms to make this card, but went way back and got what is clearly a piece of his Florida sweater as well. It’s also really nice that they used an embroidered swatch from an identifiable section; in this case, the sun behind the palm tree and stick. 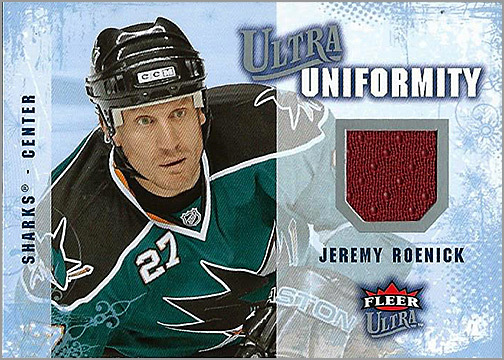 It would be neat if there was a Journeyman Series that used swatches from each uniform a well-traveled player wore in his NHL career. 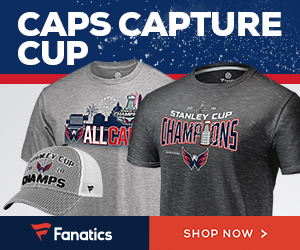 Jaromir Jagr of course would be the poster boy for this. 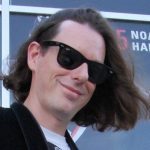 If this sort of thing already exists, let me know. I group these two cards together because they both depict fairly beloved stars who played on some great teams, but ended their careers someplace that maybe they shouldn’t have. Leetch is still a cherished figure to Ranger fans. When those guys come down to Raleigh, I still see at least a dozen Leetch Rangers sweaters roaming the halls of PNC Arena. To those blue shirt fanatics, this guy will always be a Ranger in their hearts and minds. 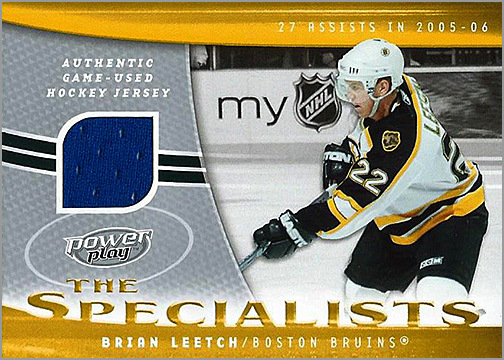 So when I pulled this card out of a pack I was initially disappointed to see the mismatched swatch, BUT I was glad I got a piece of his Ranger uniform rather than a piece from his Bruins or Maple Leafs jerseys. 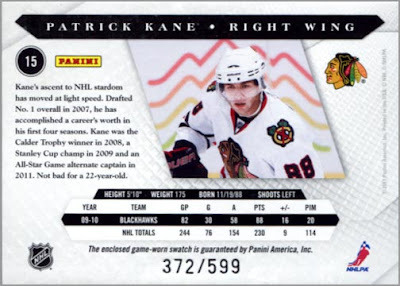 While it would have been BOSS to have gotten a piece of JR’s Blackhawks jersey on this card, there’s a similar story here. Roenick’s career was definitely coming to a quick close when he joined up with San Jose, other than tagging a few milestone stats for his tally sheet. I’m sure it was a time that Patrick Marleau would rather forget. However, the swatch comes from a better time earlier in JR’s career where he was something of an ambassador and face-of-the-franchise for a budding Phoenix organization. Thanks to putting up decent numbers — but maybe more importantly his outgoing personality — he helped grow a team where many didn’t think possible. Outside of Chicago, Phoenix is probably this city that would most love to call him “son”. I also have a Bernie Nicholls card that this the antithesis of this idea; He’s pictured in his Kings uniform where he started his career and had his best seasons, but the swatches are from the end when things were falling apart in San Jose. Hmmmm…San Jose: where careers and playoff hopes come to an end! Just kidding. Don’t kill me, Sharks fans. 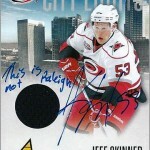 I would have passed on picking up this card at a show if it had been any old Jordan Staal ‘Canes card with a Penguin’s swatch. But the off-white color tells me that this could have been a piece of his Winter Classic jersey, and that has some historic value for his career. When I asked him to sign it, I asked him about the swatch and he agreed that it was probably from a Winter Classic jersey. Briefly, we talked about Carolina’s chances of getting to play an outdoor game; we’re hopeful. Most, if not all, teams have a Military Appreciation night to honor those who sacrifice their all for us across North America. The teams will skate in camouflaged practice jerseys that night, either in a game or in warm-ups, and often they will auction off the jerseys for charity. 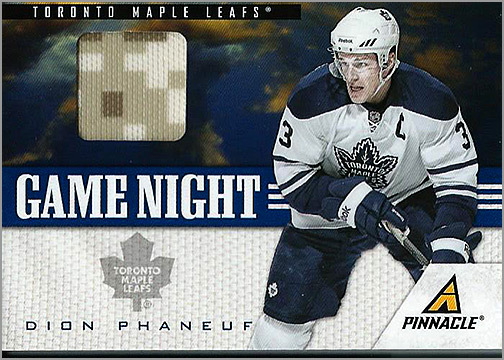 Maybe those lazy people at Panini could have at least tried to find a picture of Dion in this jersey for the card, but I guess it’s still neat to get a swatch of a unique moment during a season. Agreed that Carolina needs to have a winter game under their belts. 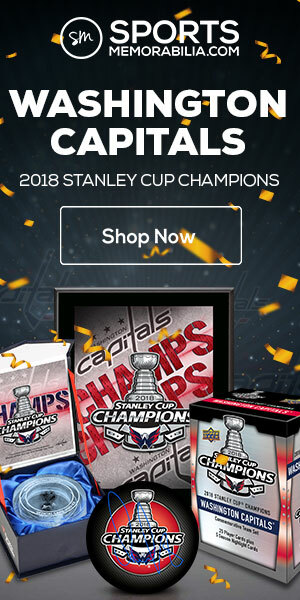 The NHL is jamming too many of the same teams over and over into the Jan 1st game. Sure, it’s my Hawks, but this is their 3rd outdoor game, 2nd in two years and the 2nd time they are in the showcase game. Spread it out. Trust us – if you think you have a weak team, put a popular team with them. Carolina can easier go up against the Isles of the Flyers and the game would make decent TV numbers. And hey – Minnesota vs Dallas. Put both teams in North Stars throwbacks. Make it happen, Bettman! NHL Journeyman swatches would be a neat draw! Would love to see the likes of Mike Sillinger, Nelson Emerson, Norm Maciver, Dwayne Roloston, Ray Whitney included among the many others. And you absolutely have to have Brent Ashton in there as well!